It takes a certain je ne sais quoi to become a Sofitel Legend Hotel of which there are just six in the world. The Sofitel Legend Metropole Hanoi was the inspiration that started the genre. Today Sofitel Legend properties places culture and art at the heart of any stay, offering a combination of refinement, pleasure and elegance. Each of the iconic properties is among the finest in the world with décor that revives a bygone age, world-class service and landmark architecture. 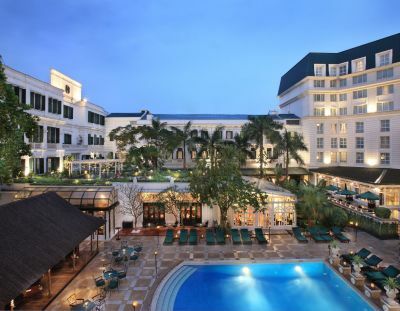 With this heritage the Sofitel Metropole has become a destination in its own right with its considered styling, exemplary service, faultless dining, and fascinating history reflecting that of the wider city of Hanoi outside. It is after all an elegant, charming, city with a colonial grace that exudes a relaxed atmosphere filled with exotic images, sounds and smells. At the end of the 18th century France dominated what is today’s Vietnam. French elegance was transferred to the Far East. 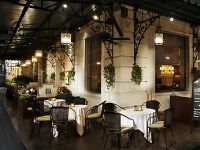 Built in 1901 the Metropole nestles in the Old Quarter of Hanoi and is a short walk from many of the city’s major historical and cultural landmarks. Two wings join together offering 364 rooms. The Metropole’s historic wing features three Legendary suites named for famous residents, writers Graham Greene and Somerset Maugham and Charlie Chaplain, who famously bought his wife’s mother on his honeymoon in 1936. The new Opera wing, added in 2006, offers a variety of guestrooms including the magnificent Grand Prestige Imperial Suite. The premiere room spans 176 square meters features its own butler, providing high tea and evening cocktails, a private dining room and its own treatment room. Here have stayed the world’s royals, dignitaries, heads of government and Hollywood celebrities. Other rooms in this wing have been individually furnished and decorated in a neo-classical style offering spacious bedrooms complemented by stylish bathrooms featuring claw foot roll top baths, walk in shower, double sinks and Lanvin products. Technology is not far away. Le Spa du Metropole Receptionists welcome you with a refreshing hibiscus tea whilst establishing your preferred treatment oils, and refreshingly, your preferred type of treatment music. The spa offers private space for treatment, meditation and the most welcome feature, an opportunity to simply recharge in peace. The product range uses only the best products with facials and body treatments tailored to each client. Bespoke packages can be created for guests seeking a specific result. Le Spa also features two themed spa suites for couples, three individual spa suites, a foot-massage room, steam bath, sauna and SoFIT a luxurious fitness centre which provides an oasis of calm away from the motorbike filled city streets. On a steamy Hanoi afternoon, step from the spa, straight to the garden pool where pith-helmeted pool attendants tend to your every need. Towels, cocktails, refreshing fruit splashes, and an international wine list accompany a selection of bar snacks. Mouth-watering home-made ice cream is served at 2pm and 4pm each day whilst a swim in the elegant, fountain edged pool leaves the body refreshed. Adjacent to the pool the candy coloured Spice Garden serves up the most elaborate Asian, international breakfast featuring everything from the traditional Bun Po Bho, a fresh and light rice noodle beef broth, to dim sum, a full range of French pastries, alongside regular western fare. At lunch time it becomes home to a vast buffet of Indochine flavours including fish steamed in banana leaves. In the evening Vietnamese gastronomy is served a la carte in the most romantic of candle lit settings. Restaurant Le Beaulieu has some of the best French dining in the Indochina region featuring steaks, lamb and fresh fish and as the hotel’s original restaurant has built a reputation for its incredible Sunday brunches. Le Terrase retains a café style atmosphere and is the perfect place to sip on a Jasmine tea and watch Hanoi’s hustle and bustle. This terrace featured on the cover of Life magazine during the American war when young children were photographed using man holes as a means to hide from the falling bombs. Today these manholes are home to magnificent plane trees indicating a far more peaceful way of life. Angelina, named for guest Angelina Jolie, is the hotel's Italian Restaurant and Lounge. It’s a capital hot spot and for the nicotine addicts is a place where indoor smoking is allowed. The chameleon Le Club Bar housed in a garden conservatory is a lunch time brasserie that becomes Chocaholic heaven during the afternoon when a high tea featuring savouries, cakes, macaroons and an extensive chocolate buffet is laid out. By evening it is the place for cocktails when an extensive menu features treats inspired by famous guests with my personal favourite a martini inspired by Bond star Roger Moore. Live jazz performances accompany the classic cocktails, grand cru and whisky collection. Duc Nguyen the eloquent, inspiring Hotel History Ambassador, leads guests on a journey through intricate details of the hotel’s past each afternoon. The roll call of guests features celebrities from all corners of the world and Duc explains that the hotel became a base for many countries embassies during the war, including Germany, Italy and Australia. In 1916 The Metropole became the first location in Indochine to screen a movie. During the American war pacifists Jane Fonda and Joan Baez used The Metropole as their base from which to highlight the plight of the US military. The most poignant part of the one hour tour is a visit to the hotel air raid bunker. As the bombs fell on Hanoi, guests and hotel employees hunkered down in the concrete shelter never knowing what they would find on departure. Joan Baez recorded a portion of her album, “Where are you now my son?” in the bunker, and the recording exists today.